The next big wave has hit our shore, and it's known as Virtual Reality. With projected growth from $685 million in revenue to $3.89 billion; it’s safe to say VR is here to stay. Though it’ll be a few more years until VR gets a firm foothold into the market, it’s guaranteed that business practices and operations will never be conducted the same once the new technology takes hold. 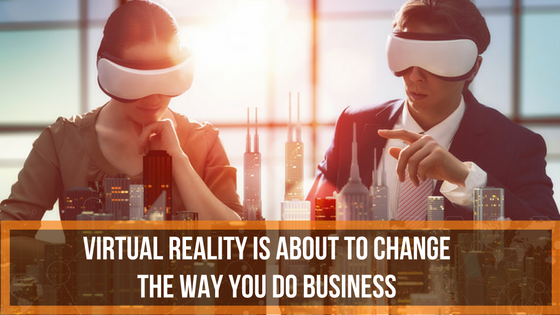 Here are some ways virtual reality will soon be changing your business. Technology has already had a huge effect on how we do business. Interviews started as a one-on-one physical meeting, then advanced to a monitor based video-conference, and soon will further evolve to virtual headsets. VR creates a real-life sense of space compared to screen-based teleconferencing. As it is, businesses spend an average of 143.3 billion dollars on domestic and international travel. This new technology will allow companies to get a more personal feel for the people on the other end of the screen. And to put the cherry on top, it ultimately reduces costs. Your conference in Japan will soon be a lot easier and cheaper to attend. With the introduction of VR, the whole customer experience is going to undergo an extreme makeover. Customers and consumers will have the option to get an up close and personal look at all your new and upcoming products. Since virtual reality headsets mirror the sights and sounds of the real world, using a combination of motion-tracking, graphics and algorithms, the testing phase will become much richer. Businesses that have already begun using VR to market their products have created a way for their customer to try out new products and services before committing. On the consumer level, instead of viewing an advertisement through the television or internet, consumers will be inside the promotion, as if they’re testing out the new product or service in real time -- creating irreplaceable value. Customer support is another area where VR will be invaluable. Currently, if customers have a problem or concern, customer service only has a description of the problem to use and work through to develop a solution. You can see how this could lead to inaccurate results. With VR, consumers will be able to do exactly what support is advising, creating a real three-dimensional interaction between support and customers; potentially making the troubleshooting process a walk in the park. It's common for newly hired employees to go through a training process where they are coached up on business practices and routines. Though these costs vary, retail and wholesale businesses spend an average of $1200 per employee for training programs. With virtual reality, employees will have the opportunity to learn and build their skills in a contained and monitored space. Studies have shown that the three-dimensional setting and interactive environment helped the subjects retain the information on a strong scale compared to video training guides. A salesman will get to experience what it’s like to negotiate in a 3D interaction, or a surgeon can be guided through a cardiopulmonary resuscitation procedure without the risk of harming a patient. The applications are endless.